Representing China Top Team and Extreme Sanda, Xiaonan “Fury” Yan, 29, has earned her third win in the Ultimate Fighting Championship. She was one of the winners at “UFC Fight Night 141,” which marked the first event of the American mixed martial arts promotion in Beijing, China. Born in Shenyang, Liaoning, China on June 16, 1989, Yan is the first ever female Chinese fighter to be signed by the UFC. She is a sanda practitioner and an alumnus of Xi’an Physical Education University in Xi’an, Shaanxi, China. 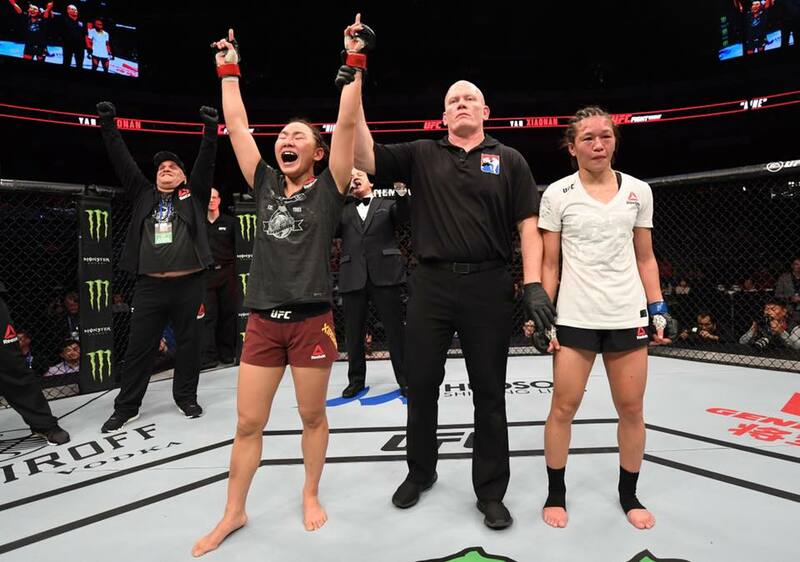 For the third time, Yan competed in the UFC at “UFC Fight Night 141.” She competed in the women’s strawweight division against Syuri Kondo, 29, of Ebina, Kanagawa, Japan. After three five-minute rounds, the strawweight bout between Yan and Kondo was left in the hands of the judges. In the end, referee John Sharp raised the hand of the Chinese contender, who was declared the winner via unanimous decision. Losing to Yan downgraded Kondo’s professional MMA record to 6 wins and 2 losses. It is her second loss in the UFC. On the other hand, winning at “UFC Fight Night 141” improved Yan’s professional MMA record to 10 wins and 1 loss. The first two opponent she defeated in the promotion were Kailin Curran, 27, Ewa Beach, Hawaii, United States and Viviane “Sucuri” Pereira, 25, of Taua, Ceara, Brazil. The UFC held “UFC Fight Night 141” at the Cadillac Arena in Beijing on November 24, 2018. In the co-main event of the evening, Alistair Overeem knocked out Sergey Pavlovich via punches after 4 minutes and 21 seconds in the first round. The main event featured the rematch between Francis “The Predator” Ngannou, 32, of Las Vegas, Nevada, United States and Curtis “Razor” Blaydes, 27, of Chicago, Illinois, United States. Their first encounter on April 10, 2016 at “UFC Fight Night 86” in Zagreb, Croatia ended in a second-round technical knockout victory of the former, who is of Cameroonian and French descent. At “UFC Fight Night 141,” Ngannou defeated Blaydes for the second time. The Cameroonian-French fighter knocked out his American opponent via punches after 45 seconds in the first round.